FootyFair's three reflect on the good, bad and ugly things in this year's World Cup. Kon: Goalkeeping has been a very welcomed bright spot in this tournament. 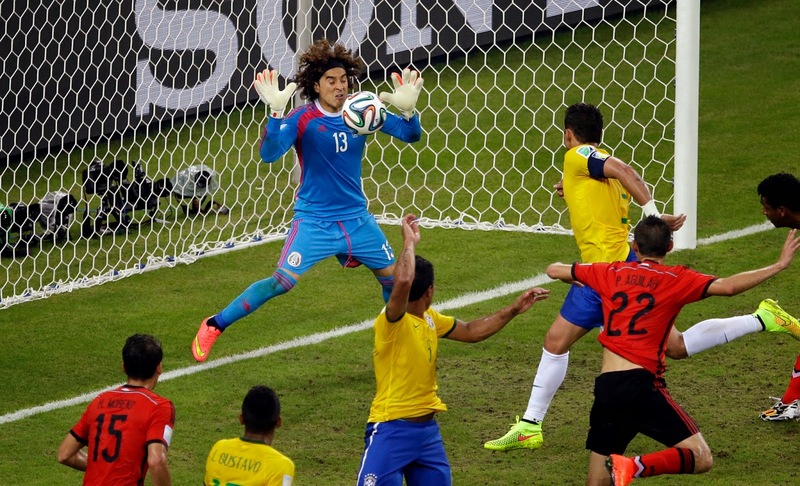 With acrobatic performances and incredible penalty saves often on display ,there have possibly been more goalkeepers worth mentioning than in any previous tournament and although some have seen the end of their campaign before the round of 16, they all deserve credit for their performances, so here they are: Brazil's Julio Cesar, Costa Rica's Keylor Navas, Dutch keeperTim Krul and Argentina's Sergio Romero for the penalty-kick heroics. Mexico's Guillermo Ochoa, Nigeria's Vincent Enyeama and Algerian keeper Raïs M'Bolhi for their incredible performances in the group stages. American goalkeeper Tim Howard for his display in groups and against the Belgians in the round of 16. And of course the golden glove winner, German net-minder Manuel Neuer for an overall outstanding World Cup campaign. Pedro:The incredible quality of the football played on the field. I don’t remember one single tournament where the quality of the games was this high. There were very few that were not good, the vast majority was not only entertaining it was extremely well played. If I had to pick my top 5 matches of the tournament to illustrate what I am saying I would have to look no further than, Spain vs. Netherlands, Australia vs. Netherlands, Brazil vs. Germany, Argentina vs. Nigeria & Colombia vs. Uruguay. These are just five examples; I would be able to come up with more. It would be a harder exercise to come up with 5 horrible games. Iain: The best group stage I've ever seen. Although I thought the quality of the knockout rounds dropped off a little bit in terms of excitement, the opening stage of this World Cup was absolutely incredible. Starting with the Netherlands 5-1 destruction of Spain, Colombia's entertaining 3-0 win over Greece, carrying through to Germany's thrilling 2-2 draw with Ghana, and America's 2-2 draw with Portugal this was a group stage to savour. There was some brilliant, positive attacking football and it was a treat to watch. Kon: Russia alongside Belgium, were pretty heavy favorites to come out of their group H at least into the round of 16. 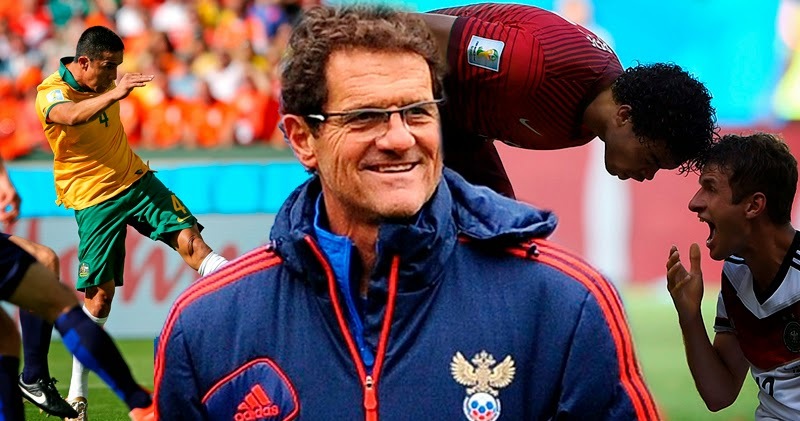 Managed by none other than Italian master coach Fabio Capello, the hosts of the next World Cup in 2018 were unable to produce even the slightest bit of football that would be considered World Cup worthy. While losing 2-1 to Belgium may have seemed excusable, draws against the South Koreans and Algerians will surely go in the books as extremely disappointing. With a squad that came out of their qualifying campaign as group winners ahead of Portugal, the Russians seemed unsure as to what they were doing in Brazil, with an awful brand of football comparable only to that of Honduras and Cameroon in this particular World Cup. Pedro: The refereeing was horrible in this tournament. From the first game between Brazil vs. Croatia to the last games, the referees made some incredible dumb and horrible calls. Looking back I don’t think we have had so many bad calls in a tournament since the 2002 Japan/Korea World Cup. 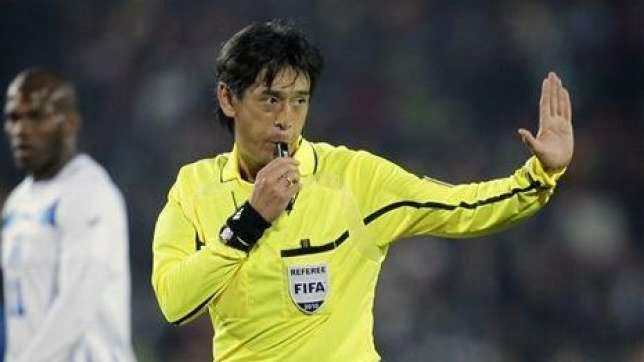 One of the worst calls was the penalty for Netherlands against Brazil in the 3rd place match. The referee managed the nearly impossible, by making two bad calls in the same play. Robben was taken down outside the penalty area, so it should be a free-kick and not a penalty and Thiago Silva should have been red carded and not yellow. He was the last man back and the rules are clear, for a foul like that when you are the last man, you get a red. Iain: The performance of Asian sides in the tournament. Although I agree with my colleagues in their assessment of how horrible Russia were to watch and the low standard of the refereeing, I was most disappointed with the poor performance of the Asian sides in this World Cup. Australia, who aren't technically an Asian side but qualify out of the AFC, were in a ridiculously hard group and predictably finished with 0 points. They did put in a decent effort, but were well short of the required quality to progress. South Korea, meanwhile, were a shadow of the energetic and technically gifted sides they've sent in the past and went out with a whimper. The biggest disappointment was Japan, who were drawn in a fairly even looking group and on paper had one of the stronger sides they've ever sent to a World Cup. Their campaign was an utter disaster though as they ended up with only a single point. For the second tournament since 2002, no Asian side progressed to the Round of 16. Kon: Cameroon's and Ghana's money "starved" squads for me was the very ugliest thing about this tournament. Instead of concentrating on their football, the two nations' players' minds were on whether or not they will be paid their bonuses. But bonuses for what, is my question. Both teams, and especially Cameroon who were not even willing to board their plain to Brazil due to concerns over their bonus pay, played horribly. With Ghana's one point and Cameroon's awful three losses in as many matches, the two greedy nations crashed out of the tournament, but not before receiving millions of dollars in payouts from their country's football associations. What ever happened to the pride of representing your country in the big tournament? And do these players really need the paycheck so bad, with the footballers of the two squads worth around 200 million pounds on the transfer market? Pedro: Suarez biting Chiellini has to be the ugly. 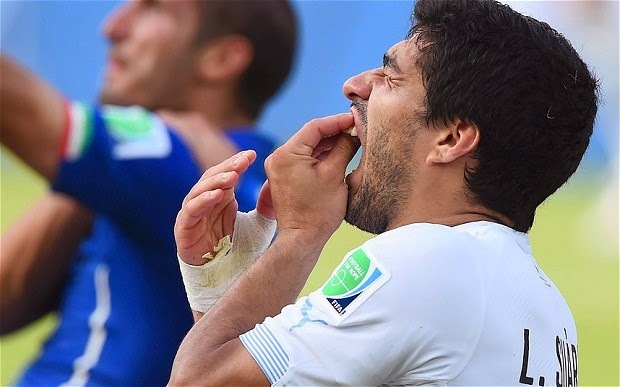 This World Cup will always be remembered not by the incredible goals or plays, but by a moment of insanity from Suarez. His bite on Chiellini during their last group stage game was a black mark on the player, his country and the tournament. Something like this should not be happening at this level and stage. FIFA handled it well, and the punishment is severe and warranted, but the action will forever live in our minds and in World Cup history. Iain: Brazil's humiliation, although perversely thrilling to witness at the time, was absolutely horrific for that proud footballing nation. As great as Germany were in that 7-1 Semi Final massacre, Brazil's defense looked like it was comprised of a bunch of drunk guys picked at random from the Silly Dog and Duck Pub. They were useless in all senses of the word, but seeing as how the players involved in the infamous Maracanazo, when Brazil lost 2-1 to Uruguay in the de facto 1950 World Cup Final, were still reminded of that defeat fifty years later I have some sympathy for the Brazilian squad. Make no mistake about it, these players will have this humiliation hanging over their heads for the rest of their lives. The defending was ugly, but the fallout will be just as harsh as many of this Brazil squad won't be asked to represent their country again and they will always have to live with the shame of the heaviest defeat in Brazil's history.